If you’re a regular follower of our blog, you’ve likely seen the topic of Time Sensitive Networking (TSN) pop up repeatedly. That’s because we believe it’s a critical set of technologies that will finally provide timing guarantees for the delivery of time-sensitive data across many mission-critical industries. In our opinion, TSN is one of the most critical new trends of which to take note. Before we get started, let’s refresh on what TSN encompasses and does for today’s automated industries. On a very basic level, TSN sorts data according to its purpose. When used in industrial Ethernet network applications, it sends non-critical data into a queue to travel as traffic will allow. But more importantly, the time-sensitive data goes into the “express lane” to move in a time-based scheme to its intended destination to guarantee a fixed latency and avoid jitter and packet loss. TSN will convert a classical Ethernet packet communication network into a deterministic network. TSN technology was developed to ensure on-time transfers of critical data, even when the network is busy. Guaranteed, specific timing for mission-critical and time-sensitive applications. Interoperability across vendors to create a seamless ecosystem that can evolve. A prime example of where we can apply TSN technology is within electrical substations. Let’s take a deeper dive. A substation is often one of several subsidiary stations within an electric power generation, transmission and distribution system. Think of the substation as a node in the electrical power network. 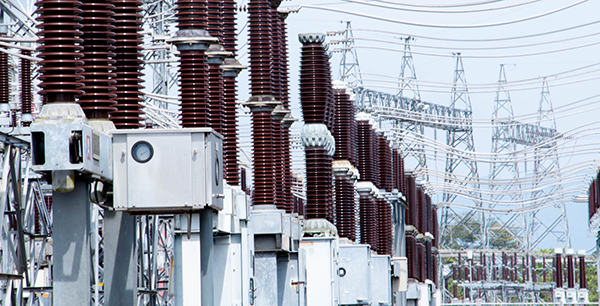 Substations have many functions, which include controlling and monitoring the switch yard, recording data and protecting power equipment via monitoring, among other energy and asset management tasks. Conventional substations can be comprised of up to hundreds of hard-wired devices that rely on copper hard-wired connections. Modern substations, however, have improved upon this setup by adhering to the new, non-proprietary standard known as IEC 61850. 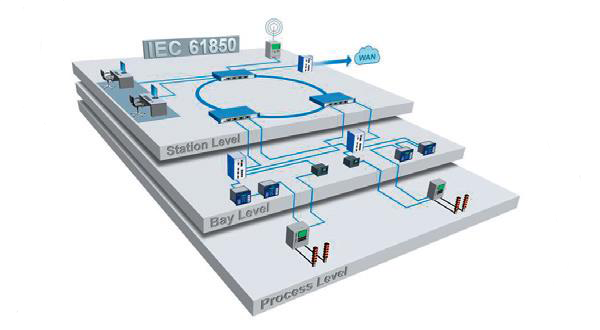 Station Level – The Station Level is where you’ll find SCADA servers and HMI workstations. This is also the level where human operators monitor the status of the substation within a shielded control room, and where the Telecommunications equipment to communicate with neighbor substations and the dispatching center are installed. Bay Level – The Bay Level consists of devices known as Intelligent Electronic Devices (IEDs). IEDs are smart devices that receive data from sensors and power equipment, as well as issue control commands throughout the substation. They collect information from the Station Level and the measurements provided by the Process Level. The IEDs can also make local control decisions, transmit the data to other IEDs, or send the data to the substation SCADA system for further processing and monitoring. Process Level – The Process Level is made up of devices such as circuit breakers and data acquisition equipment (CTs/VTs) that’s used to measure the current, voltage, and other parameters that are monitored in all different parts of the substation. Data pathways use Ethernet-based communication with higher bandwidth and redundancy mechanisms in order to transmit data packets from multiple devices on the network. Following IEC 61850 guarantees that your substation’s products will be compatible with other IEC 61850-compliant products. The goal here is to make it easier to expand your substation operation in the future. High speed IED-to-IED communication (via TSN) provides transfer times that are guaranteed. Layout of an IEC 61850 substation. Substation communication networks play a critical role in the real-time, mission-critical operations of substations. While substations previously relied on analog and one-way communication, modern substations can transmit data back and forth across a single layer and also vertically between layers. This advancement was meant to decongest the substation network by giving time-sensitive measurement data sent from the Process Level to the Mergin Units (MUs) at the Bay Level and to the protection and control IEDs in the Station Bus Level. This vertical communication is connected via high speed and bandwidth guaranteed Ethernet network. The Process Bus network handles time-sensitive data measurements between the Process Level devices and the Bay Level devices (this is what most of the substation’s protection and control functions rely on), while the Station Bus Network hosts the protection and control IEDs and handles communication between bays and outside the substation. So now that we’ve isolated the time-sensitive data being transferred within a substation network, how can we prevent data loss while guaranteeing the delivery time of packets under any circumstance? One way is by introducing redundancy measures. IEC 61850 offers several previously standardized redundancy solutions to prevent the loss of data, including the Parallel Redundancy Protocol (PRP) and High Availability Seamless Redundancy (HSR). After all, increasing network availability will facilitate bandwidth availability for packet transfer. But, while implementing network redundancy protocols is vital for improving and supporting network recovery time, they’re not enough to guarantee the on-time delivery of data. Even in IEC 61850 networks, single events and data transfers within a substation can greatly increase the amount of network traffic. When we take into consideration the large number of simultaneous communications within a substation, the availability of bandwidth becomes critical. The problem now is how to guarantee network availability for critical data streams in case of network congestion. Thankfully, this is the problem that TSN solves. Redundancy measures are put into place to prevent the loss of time sensitive data, but still fall short of implementing TSN technologies within your Ethernet network. Real-time networking – To date, Ethernet hasn’t been able to meet the growing demands for data delivery latency and timing. However, the ability to provide guarantees on data transfer timing is a key requirement for applications, such as the transfer of time-sensitive Sampled Values in Process Bus communications. This will allow low latency data transfer and elimination of jitter in real-time data transfer. Future-proofing – While the standardization process of TSN technology is expected to take a few more years, the technologies central to the TSN protocol family have been completed – and have been demonstrated successfully. These mechanisms can already be integrated in products and their benefits can be used immediately. Backward compatibility is also ensured through the IEEE 802 standardization process. This means that TSN networks that are already installed can still be used in the future. Interoperability – TSN allows for the coexistence of real-time and non-real-time communication on the same network and it supports loss-tolerance and bandwidth reservation. 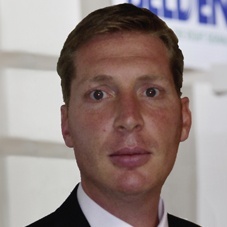 These capabilities fundamentally enhance basic Ethernet technology. As TSN standards continue to roll out, the result will be a broad interoperability between vendors. A new standard - TSN has already become one of the key enabling technologies for the IIoT and Industry 4.0. By combining TSN standards for lower layers of communication (Station Bus) and standards for higher protocol layers (Process Bus), the result is an open architecture that can be used to fully network even the most complex substation architectures.